When I moved to Toronto at the age of 5, my first friend was Rob Beatty. We went to primary school together, summer camps, and had amazing adventures together—kind of like Calvin and Hobbes at times. There was this wonderful toboggan run of death in the ravine behind his house … Rob was killed in a car crash a few years ago. Poor road design was a major contributing factor. Left his wife and four children under the age of 10. As a transportation professional, my view is that we should not construct roads that we suspect might kill people. But I often take it a step further, because the tragedy of Rob’s death presents itself to me on every project. Have I done all I can to ensure that the projects I am responsible for will minimize the potential for road trauma? I hope so. The New Zealand Government is promulgating an approach called ‘Safe Systems’. This shifts the responsibility for road accident trauma from the driver (or pedestrian/cyclist), to those of us responsible for the system. Mistakes happen, but have we designed a system which is ‘forgiving’ enough that these mistakes are not translated into major trauma or death. Not only is road accident trauma a tragedy for the individual family, but it is terrible for society as a whole. In some countries some 5% of GDP is lost due to road accident trauma. The video below was prepared by the NZ Government and is aimed at transport professionals. Very thought provoking and well done, it will challenge your views on road safety. For more information check out www.saferjourneys.govt.nz. Think about what we all can do to reduce road trauma, from driving differently to having safer vehicles. And as engineers, safer infrastructure. The World Bank has a vision of a world free of poverty. Recently, a report was published which shows how challenging it will be to achieve that vision. The figure below shows the actual growth rates in some countries, against what that growth rate needs to be to reduce poverty to < 3%. Many countries are unfortunately well short of being able to achieve the necessary growth rates which does not augur well for the future. A second aspect of poverty has to do with the poorest 40% of people. 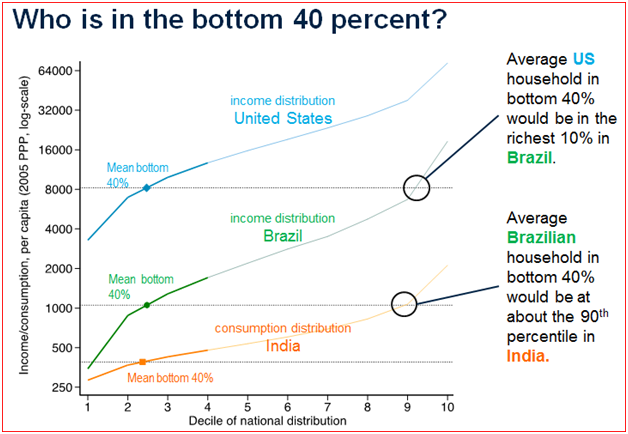 As the figure below shows, the average household in the poorest 40% of Americans would be in the richest 10% in Brazil; while the average household in the poorest 40% of Brazil would be in the richest 10% in India. Due to differences in purchasing power between countries this is a bit distorting, but shows the challenges of eradicating poverty. Some years ago Hans Rosling gave an amazing TED talk on this issue. Worth watching if you are interested in the subject. You are currently browsing the World Bank Traveller blog archives for December, 2014.